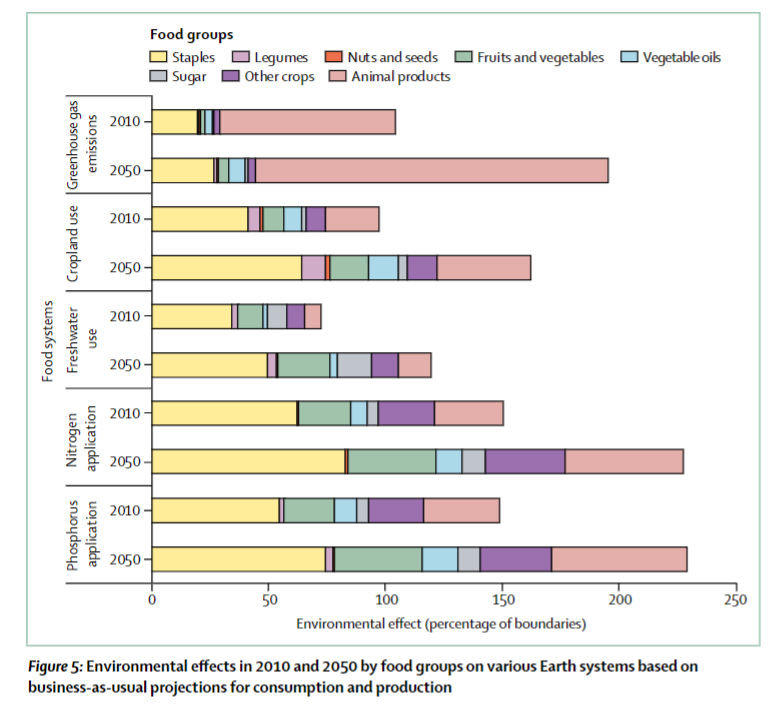 Major cross-discipline EAT-Lancet Commission on Sustainable Food has published its findings (Jan 2019). I give a summary review. With a fairly broad scientific consensus, the report establishes 3 significant items. In rich nations, this would be from better nutrition helping obesity and cardiovascular disease and the second order benefits of this. And in poorer nations, this would be from decreasing malnutrition. Where the environmental impacts of such a proposed diet are kept within likely carbon budgets and other planetary considerations. While the report mentions several cultures that eat within the reference diet, in my view, a major weakness is little acknowledgment of the scale of socio-cultural change this diet suggests. To me, a cross-disciplinary socio-anthropologist or cultural philosopher would have made a great addition as a major component of why we eat what we eat is conditioned by social and cultural value. -The reference diet is high in vegetables and low in red meat, sugar, potatoes and processed foods. includes no or a low quantity of red meat, processed meat, added sugar, refined grains, and starchy vegetables. Summary values are in table above. The “Business as usual” modelling shows the huge impact from animals on greenhouse gases. There are strong second order health effects deriving from this as well - many fewer deaths - although I suspect keeping within the energy intake limit and cutting out added sugar and processed foods would achieved a fair amount of this benefit. Cutting out processed foods and added sugar and eating about the correct amount of calories is almost universally favoured in all diets (even low carb, high fat diets as fat is high satiety) Still the economic benefits of lower health costs, and a more productive workforce. In terms of where we need to get to…There is a long way to go (See below). Rich nations eat too much red meat and potatoes. Parts of Africa are too reliant on low nutritional-value cassava (starchy vegetables). The overall paper is a fascinating read as it takes in the intersectional nature of food and the environment and health and proposes concrete guidance that enables a growing population. As I mentioned earlier, its weakness is in not weighting the cultural change factors in a strong enough way. For instance, many Americans and Europeans know they eat too much to be healthy but there is a learnt cultural attitude and difficulty in enabling change. Still, at least a good road map has been laid out. In terms of behaviours everyone can play a part in, food waste is important no matter what diet or scenario is chosen (grpah below). Unhealthy and unsustainably produced food poses a global risk to people and the planet. More than 820 million people have insufficient food and many more consume an unhealthy diet that contributes to premature death and morbidity. Moreover, global food production is the largest pressure caused by humans on Earth, threatening local ecosystems and the stability of the Earth system. Current dietary trends, combined with projected population growth to about 10 billion by 2050, will exacerbate risks to people and planet. The global burden of non-communicable diseases is predicted to worsen and the effects of food production on greenhouse-gas emissions, nitrogen and phosphorus pollution, biodiversity loss, and water and land use will reduce the stability of the Earth system. Transformation to healthy diets from sustainable food systems is necessary to achieve the UN Sustainable Development Goals and the Paris Agreement, and scientific targets for healthy diets and sustainable food production are needed to guide a Great Food Transformation. 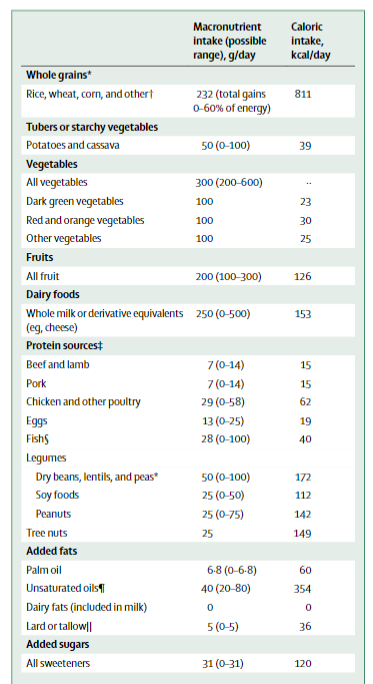 Healthy diets have an appropriate caloric intake and consist of a diversity of plant-based foods, low amounts of animal source foods, unsaturated rather than saturated fats, and small amounts of refined grains, highly processed foods, and added sugars. Transformation to healthy diets by 2050 will require substantial dietary shifts, including a greater than 50% reduction in global consumption of unhealthy foods, such as red meat and sugar, and a greater than 100% increase in consumption of healthy foods, such as nuts, fruits, vegetables, and legumes. However, the changes needed differ greatly by region. Dietary changes from current diets to healthy diets are likely to substantially benefit human health, averting about 10·8–11·6 million deaths per year, a reduction of 19·0–23·6%. With food production causing major global environmental risks, sustainable food production needs to operate within the safe operating space for food systems at all scales on Earth. Therefore, sustainable food production for about 10 billion people should use no additional land, safeguard existing biodiversity, reduce consumptive water use and manage water responsibly, substantially reduce nitrogen and phosphorus pollution, produce zero carbon dioxide emissions, and cause no further increase in methane and nitrous oxide emissions. Transformation to sustainable food production by 2050 will require at least a 75% reduction of yield gaps, global redistribution of nitrogen and phosphorus fertiliser use, recycling of phosphorus, radical improvements in efficiency of fertiliser and water use, rapid implementation of agricultural mitigation options to reduce greenhouse-gas emissions, adoption of land management practices that shift agriculture from a carbon source to sink, and a fundamental shift in production priorities. The scientific targets for healthy diets from sustainable food systems are intertwined with all UN Sustainable Development Goals. For example, achieving these targets will depend on providing high-quality primary health care that integrates family planning and education on healthy diets. These targets and the Sustainable Development Goals on freshwater, climate, land, oceans, and biodiversity will be achieved through strong commitment to global partnerships and actions. Achieving healthy diets from sustainable food systems for everyone will require substantial shifts towards healthy dietary patterns, large reductions in food losses and waste, and major improvements in food production practices. This universal goal for all humans is within reach but will require adoption of scientific targets by all sectors to stimulate a range of actions from individuals and organisations working in all sectors and at all scales. (1) Seek international and national commitment to shift towards healthy diets. The scientific targets set by this Commission provide guidance for the necessary shift, which consists of increasing consumption of plant-based foods and substantially reducing consumption of animal source foods. Research has shown that this shift will reduce environmental effects and improve health outcomes. This concerted commitment can be achieved by investment in public health information and sustainability education, and improved coordination between departments of health and environment. (2) Re-orient agricultural priorities from producing high quantities of food to producing healthy food. 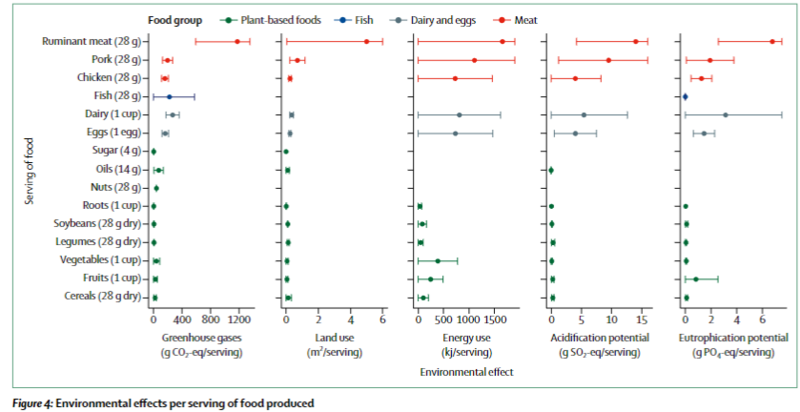 Production should focus on a diverse range of nutritious foods from biodiversity-enhancing food production systems rather than increased volume of a few crops, most of which are used for animal production. (3) Sustainably intensify food production to increase high-quality output. The current global food system is unsustainable and requires an agricultural revolution that is based on sustainable intensification and driven by sustainability and system innovation. This change would entail reducing yield gaps on cropland, radical improvements in the efficiency of fertiliser and water use, recycling phosphorus, redistributing global use of nitrogen and phosphorus, implementing climate mitigation options, including changes in crop and feed management, and enhancing biodiversity within agricultural systems. (4) Strong and coordinated governance of land and oceans. Such governance includes implementing a zero-expansion policy of new agricultural land into natural ecosystems and species-rich forests, management policies aimed at restoring and re-foresting degraded land, establishing mechanisms of international land-use governance, and adopting a Half Earth strategy for biodiversity conservation to safeguard resilience and productivity in food production. The world's oceans need to be effectively managed to ensure that fisheries do not negatively affect ecosystems, fish stocks are used responsibly, and global aquaculture production is expanded sustainably given its effect on and linkage to both land and ocean ecosystems. (5) At least halve food losses and waste, in line with global sustainable development goals. Substantially reducing the amount of food lost and wasted across the food supply chain, from production to consumption, is essential for the global food system to stay within its safe operating space. Technological solutions will need to be applied along the food supply chain and public policies implemented to achieve a 50% reduction in food loss and waste. And a summary on the EAT site.